I’ve been hesitant to mention much about a possible snow storm just after Christmas but feel it is worth a little more talk. The areas that could be potentially impacted are parts of Missouri, Illinois, Indiana, Kentucky, Arkansas and Tennessee. The reason for my hesitance is due to the lack of accuracy from the computer models have had beyond six days out since mid-November. 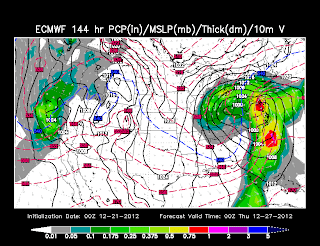 I gave the storm a brief mention the other day but I’ve been waiting to see if the models continued to show the storm. They are consistently showing it but they are still a little sporadic as to the placement of the storm. That being said, last night and again this morning they are getting a bit more in-line with each other concerning placement. As of this morning, it appears the storm could be taking a track favorable to producing measurable snow for northeast Arkansas, southeast Missouri, southern Illinois, western Kentucky, northwest Tennessee and southern Indiana. 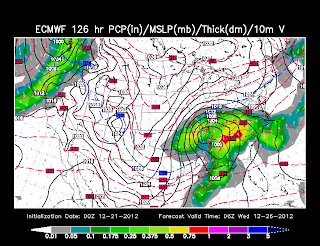 Not only could there be snow, there could be a significant amount. A favorable track for big snows in southeast Missouri, southern Illinois and western Kentucky starts with a storm in eastern Texas. That is what both NOAA’s global forecast mode, the GFS, and the European forecast agency’s computer model (Euro), the ECMWF, is showing. 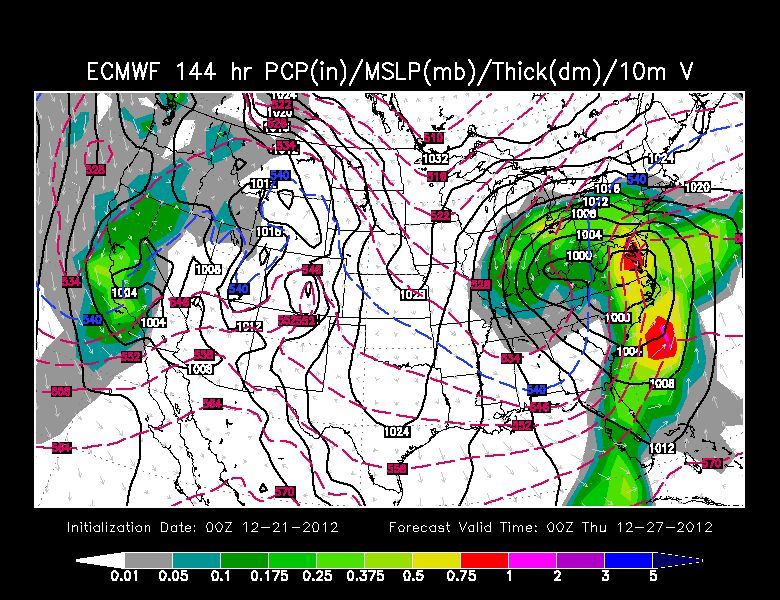 Here is what last night’s Euro is projecting at 12pm CT Tuesday. 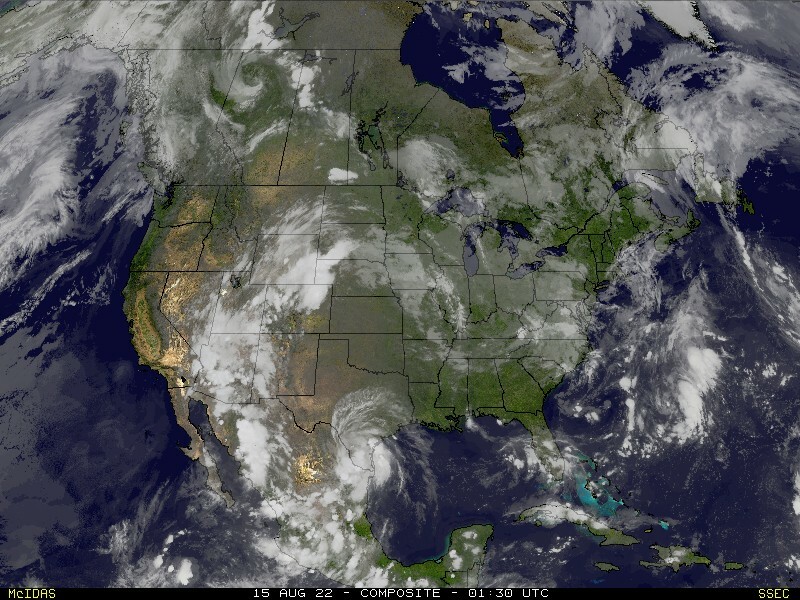 The low is moving east/northeast. Cold air is starting to move south in to the Ohio River Valley. 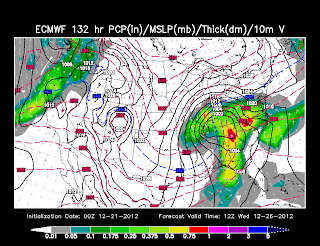 The next image is the depiction at 6pm CT Tuesday. The surface low is beginning to deepen. Cold air is wrapping in behind the storm and the precipitation shield is moving north. 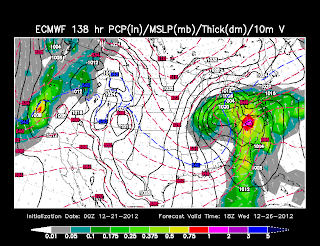 Here is the projection at 12am CT Wednesday. The storm is maturing. Cold air has filtered in to southeast Missouri and northeast Arkansas. Rain is changing over to snow. 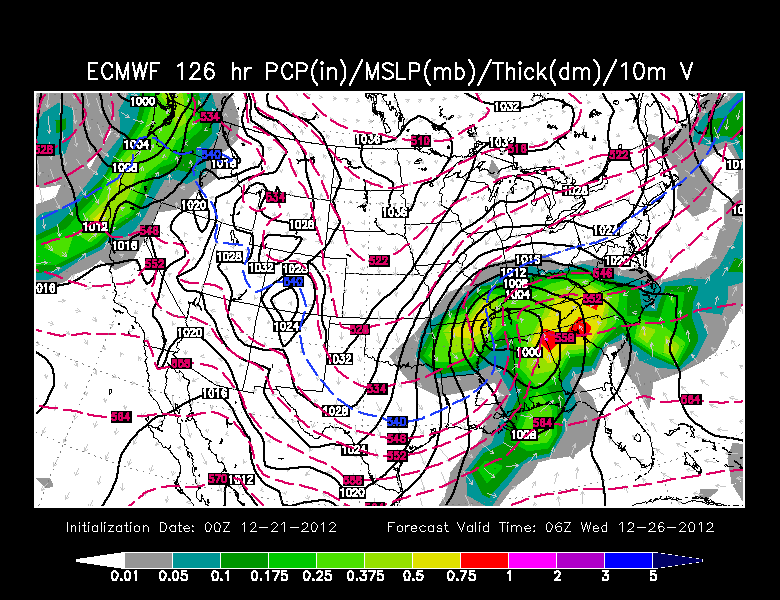 Here is the projection at 6pm CT Wednesday. At this point the storm is dumping lots of snow in southeast Missouri, southern Illinois, western Kentucky and southwest Indiana. Heavy snow continues to fall across south-central Illinois, Indiana and western Ohio. I know everyone is thinking “Ok, how much snow are we talking?” It is too early to be throwing specific numbers out but I will say it is suggesting several inches of snow. 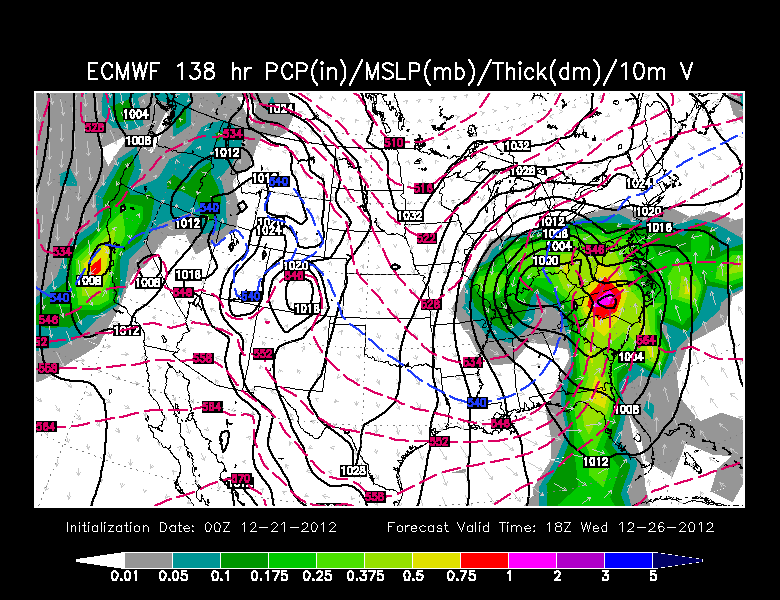 IF this pans out the way it shows this morning, someone somewhere could end up with a foot of snow. My biggest question at this point is whether or not the computer models continue to show the development of this storm. They’ve shown storms beyond six days out only to have them take them away once they are 4-5 days away. 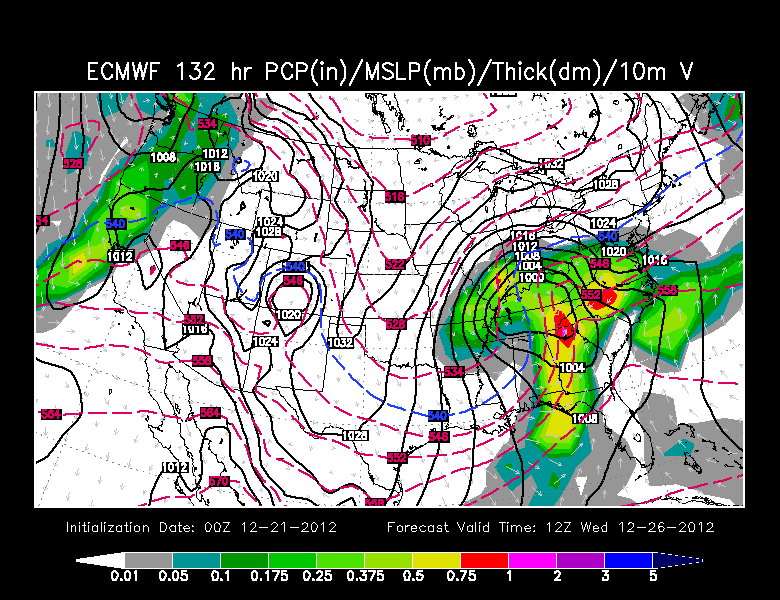 If the storm is still appearing in the data Sunday, my confidence will start to get a lot higher. How much snow would you like to see? Leave your answer in the comment section below. I’ll keep an eye on the data over the coming days and pass it along as soon as I can. I will be traveling Saturday but I will try to post an update sometime Saturday night. Oh, and my "Freak-Out-Meter" is 2 out of 10.
please dont get my hopes up!! oh I wouldn't mind 6 in. or so :) enough to enjoy but not lingering forever or causing too many problems. :) Thanks John! Lots and Lots and Lots!!! I think 6-10 inches would be nice. Just not ICE! SNOW! 3-5 in. would be nice. Not enough to cause trouble, but enough for the kids to play in...and grown-ups too!